Philadelphia’s The Silence Kit have always been a band with a very pronounced British sound. One only has to glance at their lists of influences to know that if they could have existed in any era they wanted, it would be sometime around 1980. Sadly, the title to their new album ‘Watershed’ has become somewhat prophetic as only this month two long time band members, drummer Jay Dyer and bassist Don Ocava, have parted company with the band. At least they have left their mark on the last album they worked on. First song ‘I Could Be’ is everything a post-punk track should be. It’s slick yet gritty, muscular, funky and urgent but embraces the lighter side of melancholia which The Silence Kit were beginning to explore on their most recent EPs. There has been a tendency for frontman and songwriter Pat McCay to stick a little too rigidly to the glum rock template and the case for the prosecution on this album contains two main pieces of evidence. ‘I’ll Get It Wrong’ is glummer than glum rock both lyrically and in its dry, depressing aura, whilst on the last track ‘Good For Nothing’, McCay just sounds whiny. However, on ‘Five Hundred Pieces’, McCay and co. hit on the kind of studied, self-loathing gloom (“I think you make me miserable”) their much-cited influence The Cure would certainly appreciate. The Silence Kit have become a band of surprises too, so they’re not afraid of following the relatively throwaway indie pop of ‘You Think I’m Crazy Now’ with ‘Let’s Pretend We Don’t Know’, which uses a similar serene synth wash to Joy Division’s ‘Atmosphere’ and piles on the pounding drums as McCay’s baritone intones “I Can’t Be Won”. Dyer’s pummeling drums are a regular feature of this album and they are similarly memorable on a relentlessly heavy ‘All Of The Answers’. Towards the album’s denouement, the group continue to vary their palette, as the synth-led ‘Looking Through’ balances intensity with infectious hooks and the excellent ‘I Just Wanted To Think Clearer’ presents a rewarding study in darkness rounded off by a quite lovely coda. The production may be thick and murky, the songs often murkier still but when ‘Watershed’ captures that balance between sadness and vitality, great things can happen. 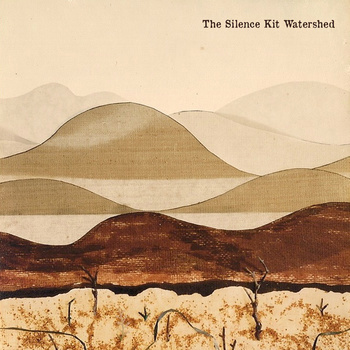 This is not necessarily a ‘Watershed’ but it’s certainly another sign that The Silence Kit are a band that looks to the possibilities of the present whist referencing the past.